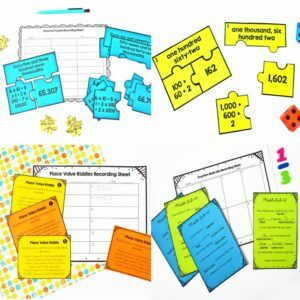 Engaging word work activities for upper elementary grades can be hard to find. 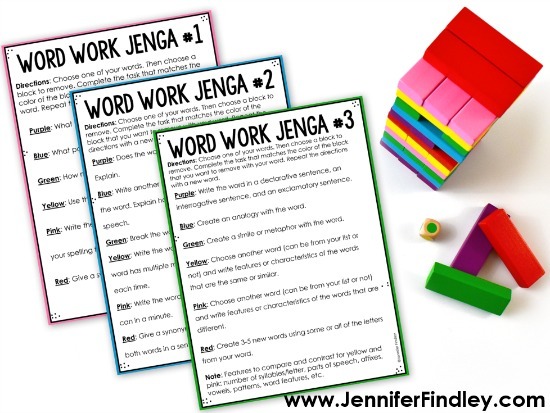 On this post, I will share three free word work activities to use with Jenga blocks. 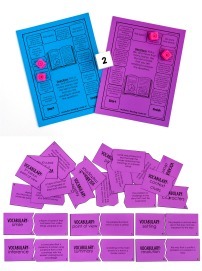 These are super engaging and can be used in a literacy center or played whole group if you have multiple Jenga blocks. 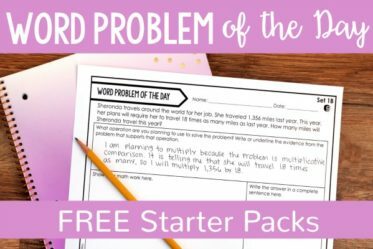 Weekly Spelling or Word Work List —> use these word work activities with any spelling program or word lists. 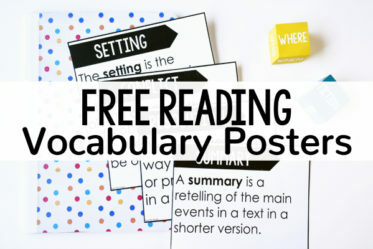 For the review, the students will select a word from their spelling or word work list. The students will then choose a color to move (by allowing free choice or having them roll a die included in most sets). Based on the color of the block, the students will answer or complete a task with the word from their list. You can have the students choose words randomly or go down their word list in order. There are three versions of the word work activity directions, with each version increasing in difficulty. This allows you to easily differentiate your word work center. Below you will find the details about the three versions. Purple: What is the meaning of the word? Blue: What part of speech is the word? Green: How many syllables does the word have? Yellow: Use the word in a unique sentence. Pink: Write the word twice without looking at it. Check your spelling for accuracy. Red: Give a synonym or antonym for the word. Purple: Does the word have multiple possible meanings? Explain. Blue: Write another word in the same part of speech as the word. Explain how both words are that part of speech. Green: Break the word into syllables. Yellow: Write the word in two unique sentences. If the word has multiple meanings, use a different meaning each time. Pink: Write the word accurately as many times as you can in a minute. Red: Give a synonym or antonym for the word. Then, use both words in a sentence. Purple: Write the word in a declarative sentence, an interrogative sentence, and an exclamatory sentence. Blue: Create an analogy with the word. Green: Create a simile or metaphor with the word. Yellow: Choose another word (can be from your list or not) and write features or characteristics of the words that are the same or similar. Pink: Choose another word (can be from your list or not) and write features or characteristics of the words that are different. Red: Create 3-5 new words using some or all of the letters from your word. Note: Features to compare and contrast for yellow and pink: number of syllables/letter, parts of speech, affixes, vowels, patterns, word features, etc. 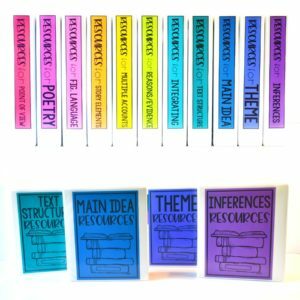 Tip 1: Have all of the students do the work at the same time (with their specific spelling words and tasks based on the color they chose/rolled). After the work is complete, then have the students move their pieces one after another. This will keep all of the students on task and working, instead of sitting around waiting. Tip 2: Keep your groups as small as you can. Keeping the groups smaller keeps the Jenga blocks from toppling sooner and repeatedly. I have found that if the groups get larger than 4 students, the Jenga blocks topple too frequently. If you have multiple Jenga games, then you can have several games going on at a time. 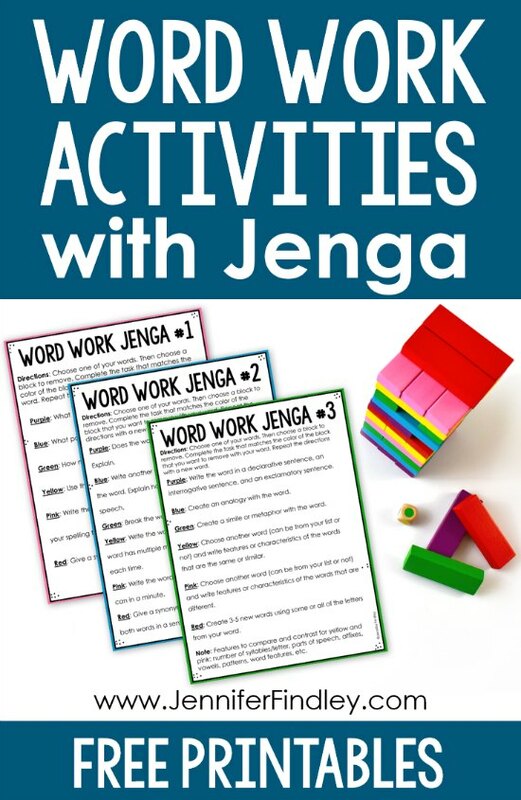 If you only have one Jenga game, then you could play this game at your teacher table or place it in a literacy center. Tip 3: For accountability, have the students record their work the recording sheet included in the download or on a piece of paper. Another option is to have students use whiteboards to record their work. 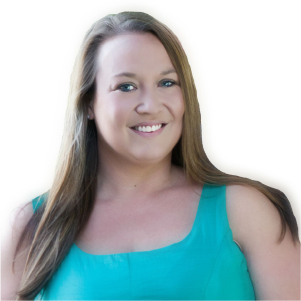 How Can I Get the Word Work Activities for FREE? 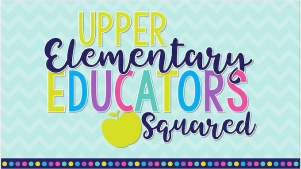 Click here or on the image below to download the directions pages to use these word work activities with your students. Want More Jenga Review Games? 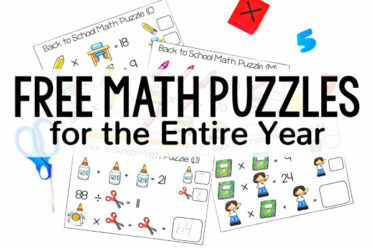 Click here to check out my collection of FREE Jenga review games. 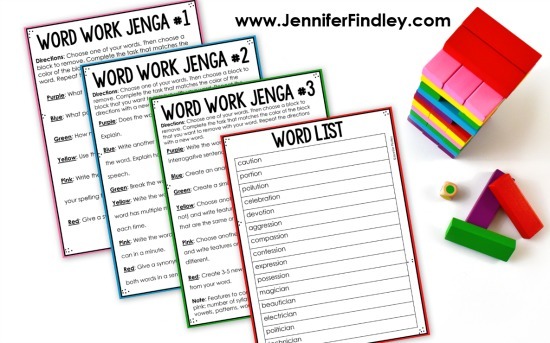 These word work Jenga activities would make a great whole-group game (if you have multiple sets of the Jenga blocks). However, it also works great as a literacy center. 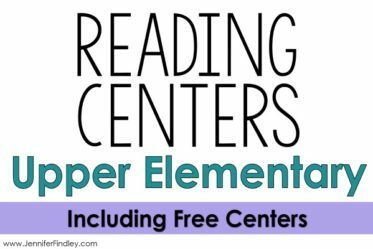 Click here for even more ideas for reading centers for 4th and 5th graders. 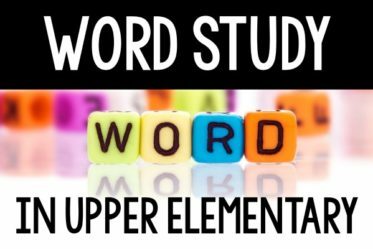 Word Study in Upper Elementary – This post shares an overview of how I teach word study/spelling in 5th grade. 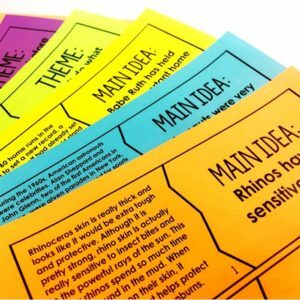 Word Study Activity – This post shares another favorite (and very low-prep but good rigor) word work activity for 4th and 5th grade students.